We tried this jacket on our Fit Check mannequins and thought they fit great. Huey is wearing a Med and Dewey is wearing an XL (take the “View Larger Images” link above to see those pictures). We also measured a selection of jackets. Based on those checks, we recommend you buy the size you normally buy in men’s clothing. If you want to check for size based upon a chest measurement or the size you wear in a suit coat, then please use the chart below. 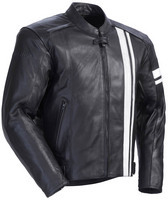 These jackets are primarily for street riders and so they have a fairly “relaxed” fit. The jackets taper moderately from the chest to the belly/waist… about 4”. If you have a bit of a belly, you might want to check yourself with a tape to make sure the size you select will work. Example: a size XL will accommodate a 46” chest and the max belly is about 42”. Here is Tour Master’s chart. Sleeve lengths listed are from the shoulder seam to the end of the arm cuff.